This year for Easter, I could not find that perfect dress for my little girl. This cute little sun dress from Old Navy was very friendly on the budget, but it lacked some flare. With just a few tweaks, I was able to make a custom design akin to the ever-so-desirable styles from J-Crew from an otherwise blah looking outfit. 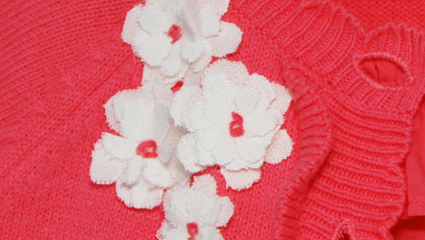 Here is a close-up of the flowers that were attached to the collar of the seater. To make the flowers, I cut a strip of white fabric and held it up to the sweater to get a rough idea of the right size. I then folded the strip so that each square would make a duplicate of four. I sized the squares so they can be stacked four layers on top of each other, each one smaller than the last. Once the squares were sized, I cut each square into a circle. 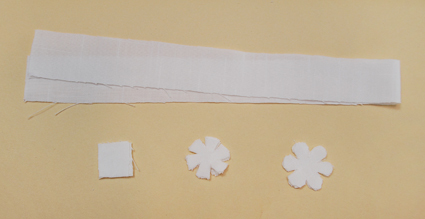 Notches were cut into the circle to shape flower petals. Finally, each petal was trimmed so that it was round on the edges. To assemble the flowers, I stacked up the cut-outs in varying sizes and also used a little trimming from the dress itself as the center. 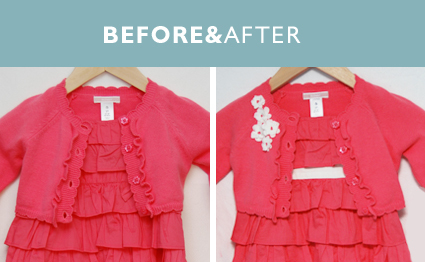 With a needle and thread, stitch the layers together by hand. 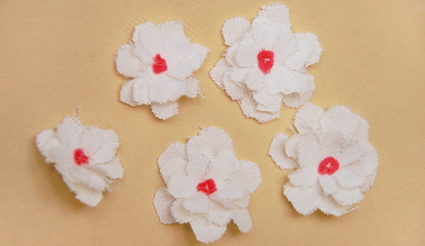 If you are using new fabric, as I did, the flowers may lay a little too flat. You want them to curl and look a little rough around the edges. I rinsed these flowers in the sink and used a blow dryer to rough them up a bit. Then it’s time to sew the flowers onto the sweater. The next step to refashion this outfit was to “replace” the pink waistband on the dress with a white one to match the flowers. 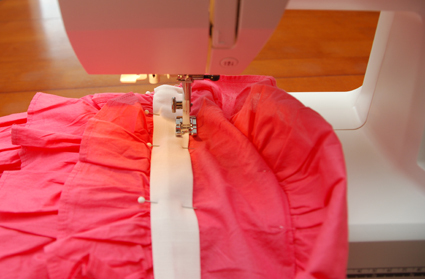 In fact, it was as easy as sewing right over the existing waistband. Here is where I started, having cut a long strip of fabric and ironed the rough edges in on themselves. This dress had a zipper on the side. 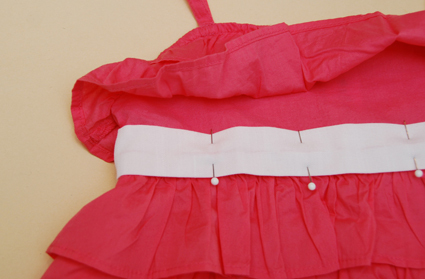 I began pinning the waistband at the zipper and continued around the dress until it reached the zipper on the other side. 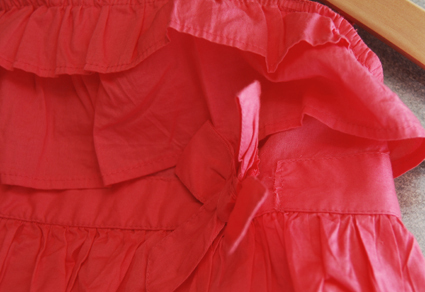 After pinning, sewing the waistband on the dress was a breeze. While getting ready to sew on the waist band, I also removed a bow that came with the dress and thought I’d try to make it into an accessory hair piece. It was scary, but I cut right into the waist band and removed it. 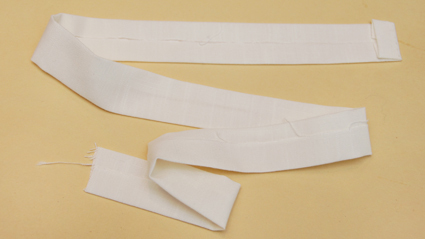 After removing the bow, it was a simple few steps to wrap the middle knot with white fabric and hand-stitch it together in the back. 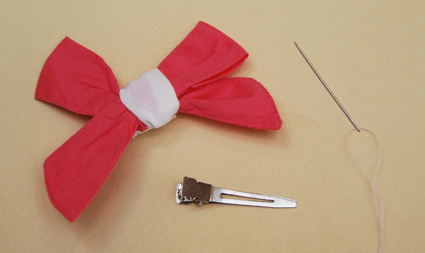 The last step is to hand-stitch the bow to the hair clip. This may be a bit cumbersome, but it will result in a very sturdy hair accessory. Super cute Katie! Well done!